Chemical safety in the workplace requires solid cooperation between management and employees. Workers must wear the proper PPE, which will vary based on the chemicals being handled. To maintain industrial hygiene, employees must follow procedures for handling chemicals, based on the company’s HazCom, the Hazard Communication Plan. All workers should know procedures in case of a chemical spill. Chemicals require labeling according to GHS universal safety standards, and understood by non-english speakers. Safety Data Sheets must be fully accessible to employees for good chemical safety. Dan Clark: Let’s talk chemicals! I don’t mean the weapons grade steak sauce in your fridge. I mean industrial chemicals. Hello, I’m Dan Clark here with The Safety Brief. This is where we talk about health and safety hazards in today’s demanding industrial and construction worksites. Good news! That 55 gallon drum of Red Bull you bought is not a hazardous chemical. But many chemicals pose some of the most significant risks in the industrial workplace. They can cause big problems, from eye irritation all the way to cancer. 1. Proper PPE. Depending on the chemical, liquid resistant gloves and clothing might be needed. In some cases, respirators may be necessary. Especially if there’s a report of Dijon mustard gas in the lunch room again. Make sure the PPE is effective for the chemicals used, and that they fit the worker. 2. Follow Procedures For Handling Chemicals. Employers, listen up. You must have a written plan, The Hazard Communication Plan or HazCom. This HazCom should explain the handling of chemicals and employees should have access to it. And use it. Workers and managers should know what to do in the event of a chemical spill. When moving hazardous chemicals with forklifts or carts, always strap down containers. Cinch before they move an inch. 3. Chemicals Require Labeling. And not just Mr. Yuk stickers. And they also need SDS’s. This is the Safety Data Sheets. Chemicals are highly regulated and must follow GHS guidelines during transport, storage and use. Containers that hold chemicals cannot erode or leak. Employers must label containers and have those Safety Data Sheets on hand that contain all required GHS information, including hazard pictograms, chemical properties and the PPE requirements. Employees should be trained on how to read the labels and SDS’s which tell them important information about dealing with a specific chemical. Safety Data Sheets should be easily accessible for employees. Make sure that workers who don’t speak English can get the information they need. 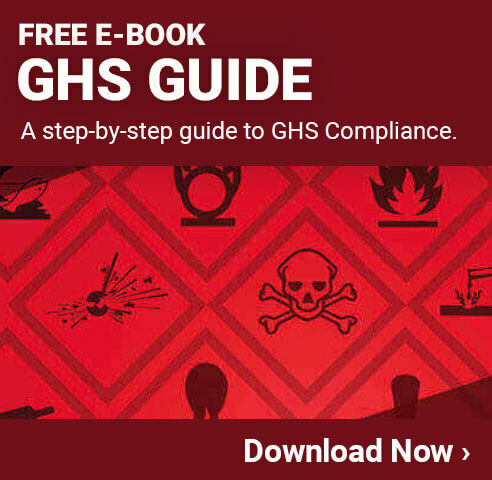 Safety Data Sheets have 16 parts as required by GHS standards. Those are the three main parts. So, remember for good chemical safety, employees need to be able to access and understand labeling so they can wear proper PPE, handle materials carefully and follow guidelines should there be a spill. OSHA hazardous substances link. OSHA Toolkit: Transitioning To Safe Chemicals.